Pulaski Day is the first Monday in March. Today, we are looking Presidents’ Day square in the eyes. Our nation’s first president, George Washington, was born on February 22, 1732. 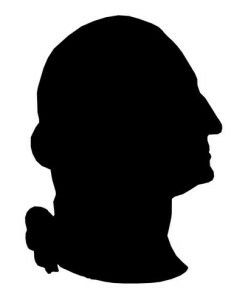 Rather than a general or a president, Washington considered himself a farmer. From various camps throughout the Revolutionary War, he frequently wrote to his plantation manager at Mount Vernon with questions and instructions. As mentioned, Washington’s favorite foods included fish. He was also fond of String Beans with Almonds, Steak and Kidney Pie, mashed sweet potatoes, and Fish Muddle.1 He loved pickles and condiments, especially mushroom catsup (remember, even Heinz made 57 varieties of ketchup at one point, tomato ketchup being just one variety). While he was not a big fan of sweets and desserts, Washington enjoyed Tipsy Cake (a trifle) and his wife’s Whisky [sic] Cake. Like his fellow Americans, he also liked beer, specifically dark Porter ale. Washington’s plantations bordered about 10 miles of Potomac River shoreline. Washington noted that this area was “well supplied with various kinds of fish at all seasons of the year.”2 In the spring, when the shad and herring ran, Washington’s slaves were dispatched to the river to fish. Their catches were packed and sold at market. His slaves also supplemented their rations with their own catches from the Potomac. Perch is a common Potomac catch that probably found its way to Washington’s dinner table and into his slaves’ meals. 1. Preheat oven to 350°F. Prepare a sheet pan with a commercial oil spray. 2. 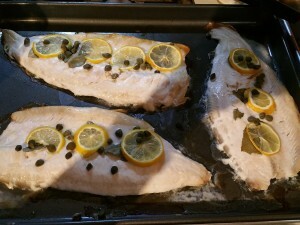 Arrange fish (frozen or defrosted) in a single layer on pan. 3. Arrange lemon slices on top of fish, tucking bay leafs underneath the lemon. 4. Scatter about 1-2 tsp of capers on top of each fish fillet. 5. 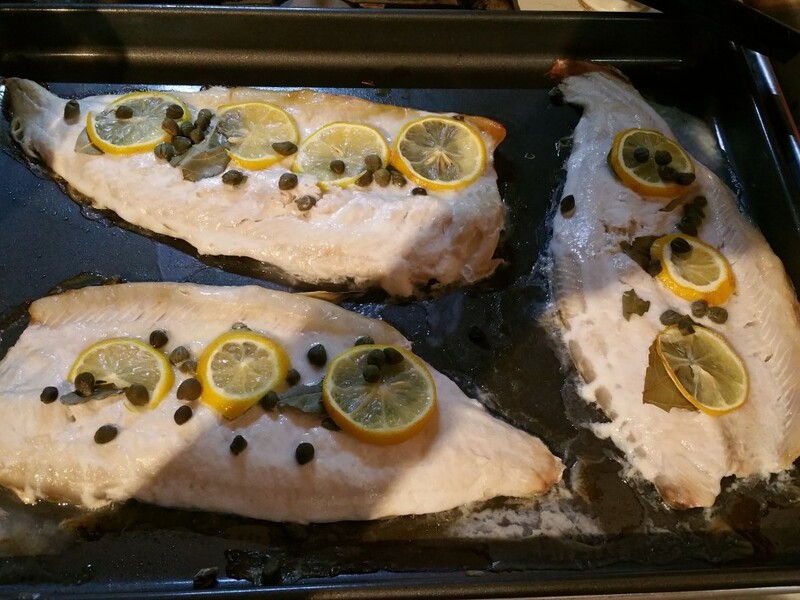 Bake for 25 to 30 min., or until fish flakes easily with a fork. Green beans are a perfect accompaniment to any fish. 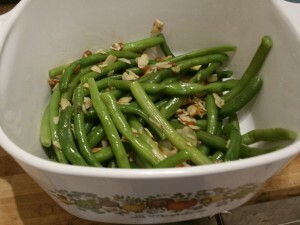 This simple green bean side is quick and easy. 1. Steam green beans, covered, over ½ c boiling water for about 10 minutes, or until just tender. Drain and set aside. 2. In a skillet, melt butter and add almonds, stirring over low heat. Stir in lemon juice. Stir in green beans and reheat. The instructions to this simple but satisfying dessert are in Martha Washington’s own words. 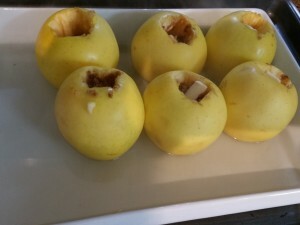 Another option: Today, the general recipe is to core the whole apples (leaving enough apple at the bottom so the filling doesn’t leak out), stuff each apple with a bit of butter and brown sugar, place the apples snuggly in a pan, add about 1/2″ to 1″ of boiling water to the pan, and bake the apples at 375°F for 30 to 45 minutes or until tender. 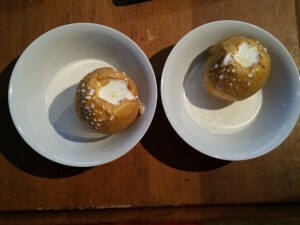 Instead of cream, most modern Americans serve baked apples with vanilla ice cream. Notes: I used organic Golden Delicious apples, but did have a pan where they fit snuggly. Either my pans were too big or too small. I used about 1-2 tsp brown sugar per apple and about thin slice of butter. As an experiment, I served mine with cream, like Martha Washington would have. They were rich but good. 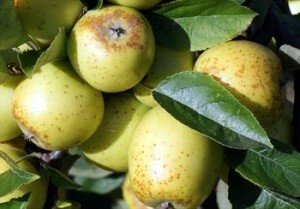 The Albermarle Pippin, or Newtown Pippin, is one of the oldest apple varieties in the U.S. It is said to have first been discovered as a chance seedling (a “pip”) in Queens County, New York, around 1730. A good cooking apple, the tart fruit is light green to yellow in color. Supposedly a favorite of Washington, Thomas Jefferson, and Benjamin Franklin, it is still produced on a small scale and available online through specialty markets. Combining the former February holidays of Washington’s Birthday and Lincoln’s Birthday into one day, Presidents’ Day celebrates all of our nation’s presidents (whether or not they all deserve to be celebrated is another matter). It is one of five holidays that were part of the 1968 Uniform Holiday Act, which went into effect in 1971, nationalizing the days and moving them to the Monday closest to their actual date. The main purpose of the Act was to give U.S. travel a boost with three-day weekends.4 The other holidays involved were Labor Day, Memorial Day (formerly Decoration Day), Columbus Day (formerly Oct. 12), and Veterans’ Day (still celebrated in other countries on Nov. 11 as Remembrance Day). In the late 1980s, Martin Luther King Day became part of the federal Monday holidays. His birthday was Jan. 15. 1Cannon, Poppy & Patricia Brooks. The Presidents’ Cookbook: Practical Recipes from George Washington to the Present. 1968: Funk & Wagnalls. 2Mount Vernon Ladies’ Association. www.mountvernon.org. 3Kimball, Marie, ed. 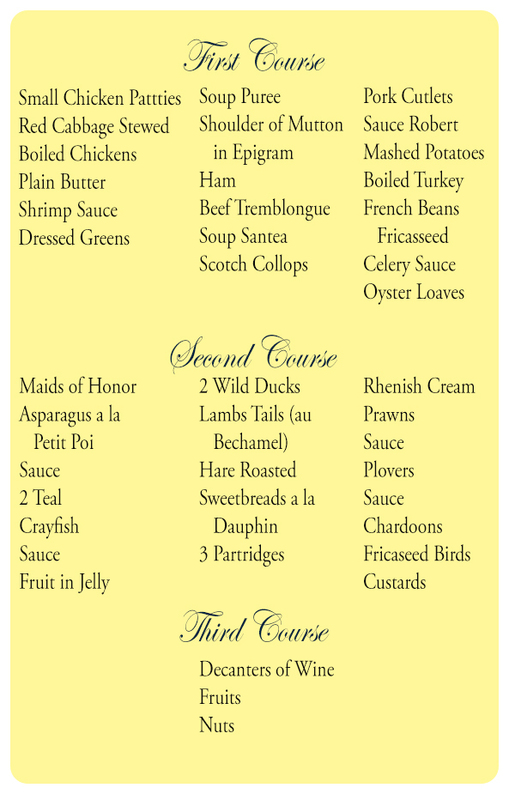 The Martha Washington Cookbook. 1940: Coward-McCann, New York City. 4The History Channel. http://www.history.com/topics/holidays/presidents-day. A & E Networks.